Churchill’s Secret War with Lenin: British and Commonwealth Military Intervention in the Russian Civil War, 1918-1920. Damien Wright. Solihull, UK: Helion & Company, 2017. Recent discourse about Russian-Western interaction over internal disputes has focused on Russia’s annexation of the Crimea in 2014. One hundred years ago, the opposite was the case. From 1918-1920, British, Commonwealth, French, Japanese, and American troops all fought and died in the Russian Civil War. 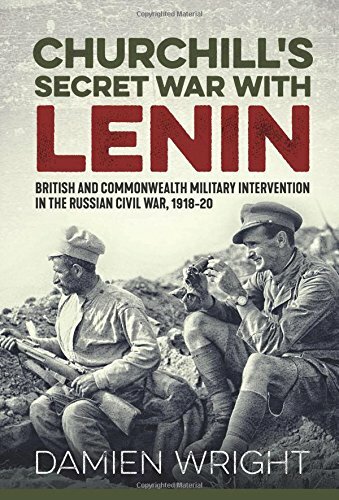 Damien Wright’s Churchill’s Secret War with Lenin: British and Commonwealth Military Intervention in the Russian Civil War, 1918-1920, focuses on the United Kingdom’s role in the aftermath of the Bolshevik Revolution. Wright’s lively writing and mastery of primary and secondary sources, along with a wealth of period photographs from the Imperial War Museum and private collections, result in an eminently readable account of “one of the most ill-conceived and poorly planned campaigns of the twentieth century.”Modern readers will readily find parallels to current Western interventions in Iraq and Afghanistan. WHILE LARGELY A SIDESHOW AT THE TIME, INTERVENTION IN THE RUSSIAN CIVIL WAR HOLDS A VARIETY OF PARALLELS AND WARNINGS FOR MODERN STRATEGISTS, TACTICIANS, AND POLITICIANS. The October Revolution, its impact on World War I, and the Russian Civil War are well covered elsewhere. Classic texts like Trotsky’s History of the Russian Revolution and John Reed’s Ten Days That Shook the World, as well as recent works like Sean McMeekin’s The Russian Revolution: A New History and Laura Engelstein’s Russia in Flames: War, Revolution, Civil War, 1914-1921, all cover the nuances of Russian political and economic life, the aims and ideology of the Bolsheviks, and the immediate chaos of post-Tsarist Russia. Thousands of British and Commonwealth troops fought across Russian territory with a variety of shifting goals, allies, and ambiguous political objectives at a time when many more of their countrymen were fighting on the Western Front and in Italy. While largely a sideshow at the time, intervention in the Russian Civil War holds a variety of parallels and warnings for modern strategists, tacticians, and politicians. Contemporary readers will see analogous situations in Civil War Russia to American involvement in Iraq or Afghanistan. Issues with combined warfighting, interaction with civilian populations, and locally raised forces all have echoes today. Though not intended to be read as an allegory for modern interventions, Churchill’s Secret War with Lenin ably serves as a reminder that the problems of foreign intervention in civil wars are neither new nor unpredictable. Across the theaters of the conflict including Northern Russia, the Baltic, Siberia, Southern Russia and the Crimea, and the Caucasus, British and Commonwealth troops were beset by a variety of problems and, in many ways, were waging different small wars in each place. Contemporary coverage of the British and Commonwealth intervention was muzzled or overlooked in favor of coverage of the Western Front. Following the intervention, the actions and consequences were swept under the rug as “the British government attempted to cover up its military involvement in Russia…by classifying official documents relating to the campaign under the ’50 year rule.’” This enforced silence, which was assisted by a war-weariness after the Armistice in November 1918, kept the Russian Civil War largely out of official histories and academic works. 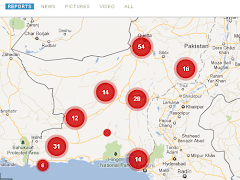 Slowly the curtain is being lifted on the failed intervention. Colonel John M. House’s Wolfhounds and Polar Bears: The American Expeditionary Force in Siberia, 1918-1920, and Benjamin Isitt’s From Victoria to Vladivostok: Canada’s Siberian Expedition, 1917-19, are two recent examples of scholarship documenting Allied efforts in the Russian Civil War. Combined operations with Allied forces struggled from the outset. In Murmansk, for example, the British were invited to land by the Bolsheviks themselves who believed peace with Germany had broken down. Later, these same troops were involved in combat against those same Bolsheviks, as well as Finnish forces, and German advisors at varying times. In Crimea, “the British were concerned that the French might gain too much influence on [White General Anton] Denikin and were keen to start delivery of supplies through Novorossiysk as soon as possible.”American forces in Northern Russia had different mandates and objectives than their Commonwealth counterparts, initially making integration for combined warfighting difficult. THE OCCUPATION OF ARCHANGEL DEVOLVED RELATIVELY QUICKLY AS THE BRITISH STRUGGLED TO MAINTAIN ORDER AFTER DISSOLVING THE EXISTING GOVERNMENT AND INSTITUTING MARTIAL LAW. Interactions with the White forces also left much to be desired. In Southern Russia, British troops found supplies provided to the Russians for sale in local markets while White troops lacked basic uniform items. When pressed about this malfeasance, White officers claimed that most Russian soldiers were unaccustomed to having more than one tunic or a pair of pants in the first place. In Sarapaul, Siberia, the Red Army dug in their field artillery virtually within sight of the White Army HQ, and launched a surprise attack, “indictment on the White command…. [and its] complete lack of military intelligence and situational awareness so crucial to a battlefield commander.”Outright betrayals of British units, defections, and mutinies were not uncommon either, increasing the tensions between Commonwealth forces and the Whites. Distrust was common, further exacerbating efforts to work towards common purposes. In combat, green on blue incidents also occurred, echoing recent events in Iraq and Afghanistan. Intervention will begin on a small scale, but with each step forward will grow in scope and its demands for ships, men, money and material... Intervention in the north of Russia will mean that we must feed the entire north of Russia…Every foreign invasion that has gone deep into Russia has been swallowed up...If we intervene, going farther into Russia as we succeed, we shall be swallowed up. Though an American warning, Cole accurately sums up the intervention and its costs for the Allies across all fronts in the Russian Civil War. Poorly planned, inadequately resourced, and with an ambiguous endstate, the British and Commonwealth effort in Russia’s Civil War started small and ended largely in failure as more and more resources were pushed into the conflict without a decisive result. Indeed, everywhere but the Baltics, where the goal of preventing a German or Bolshevik occupation of the new republics was accomplished, the British failed to meet their ambiguous and shifting strategic objectives. Overall, Churchill’s Secret War with Lenin is well-written and a balanced account of both the successes, often at the tactical level only, and the failures of the British intervention. Two minor critiques can be leveled against the book. First, the title is somewhat misleading. Winston Churchill, one of the towering figures of the 20th century, makes only a cursory and tangential appearance in the story despite his role as the Secretary of State for War starting in 1919. Readers looking for a study on Churchill or British politics will need to look elsewhere. Second, interactions with allies, especially at the operational level, could have been expanded to better inform readers of the planning process, constraints, and restraints the combatants experienced during the intervention. The Americans, Canadians, and French all appear in the narrative but the complications they pose to British and Commonwealth forces and leadership could be better explained though this expansion might have diluted the book’s focus. Modern readers will find parallels and similarities between the intervention of a century ago and those more recent. Churchill’s Secret War with Lenin engagingly illuminates the history of a small war that served as both part of the Great War and the dawn of the Cold War between the Soviet Union and the West. Wright masterfully presents the history of a failed campaign in compelling human and strategic terms through his use of primary sources, synthesis of other works, and his own analysis. Strategists, planners, and tacticians will all take something away from the work.